The Uni controllers sense the voltage on the pot input (after the gain preset) to give pot fault protection. If the voltage on the pot wiper is ever greater than about 5.3v the pot fault protection engages. Full speed corresponds to about 3v at this point. This works properly with a standard pot input but, if a pwm input signal is used, there are problems if the peak amplitude of the pwm exceeds 5v – the pot fault can operate on the peaks of the pwm input signal and will then prevent proper operation. It is therefore often necessary to pre-filter the pwm fed to the Uni, so is sees a d.c. voltage and not a pwm waveform peaking above 5v. The internal power relay operates at about .55v and full speed is about 3.5v, so a 5v amplitude pwm will need to vary between 10% and 70% duty cycle for full range operation. To further illustrate what happens, the input circuit is as below. Battery voltage feeds the top of the pot via a 10K resistor: a 6v2 zener stabilizes this voltage so it does not alter with varying battery voltage. A diode in the top of the pot protects the diode should a wiring fault apply over-voltage to the pot top. Pot wiper feeds to the gain preset whose wiper feeds the demand voltage to the internal PWM modulator. Should the voltage on the preset’s wiper ever exceed 5.5v (a 4.7v zener operating the base of Trd1), Trd1 turns on engaging the pot fault protection. This of course is sensitive to the peak value of any input voltage. Tr1 and Tr2 drive the on-board power relay, which then operates at the Vbe of Tr1 on the preset’s wiper (about 550mV). 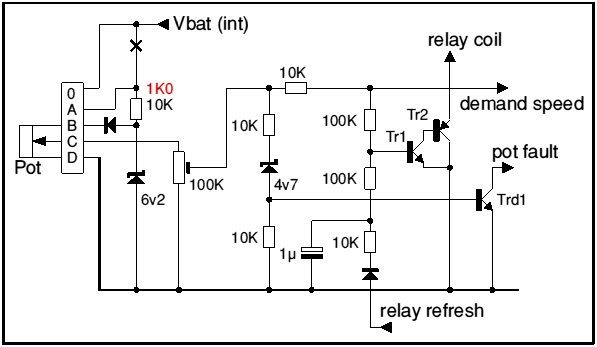 The relay is held on (Relay refresh) by the pwm output signal when the speed pot is returned to zero, so the controller switches itself off only when it has ramped down to zero speed.